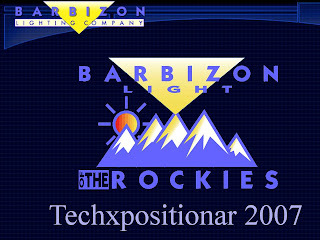 Barbizon Light of the Rockies held it's Techxpositionar last Thursday and Friday on the Colorado Studios' sound stage. Customers from Denver and from several states away came to see the latest in lighting fixtures, control and accessories. Everything from a basic gel scroller to the latest in projection and LED technology was on display for attendees to touch and play with. Representatives from Electronic Theatre Controls, Martin, High End, Selador, Ocean Optics, and Total Structures were also on hand to answer questions and present sessions. It was two very full days of very useful information from lighting basics to the very latest in digital media and content creation. We'd like to thank everyone who attended, and all the people that made this event possible. From the techs who wired it all up to the manufacturers who pulled strings to make all the gear available. It was a truly team effort on everyones part. Stay tuned for our other upcoming events and if you happen to be travelling to Atlanta for the Worship Facilities Expo the week of 10/22 or LDI in Orlando in November be sure to stop by our booths and say hello!